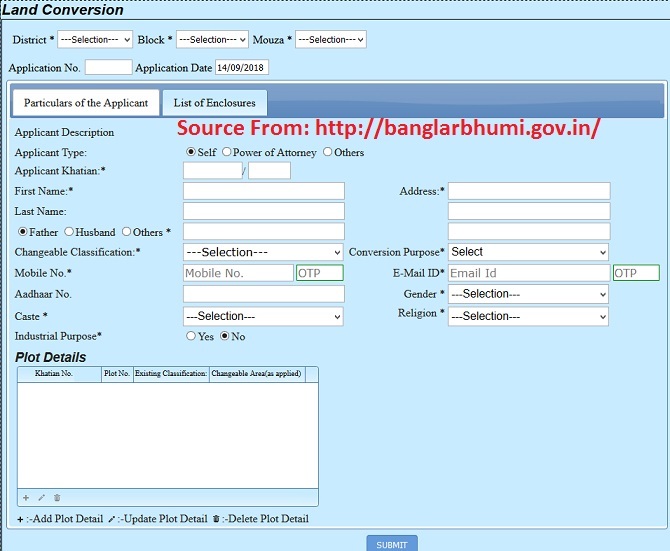 Instructions on Filling Banglarbhumi Land Conversion Online Application at banglarbhumi.gov.in website….. There could be personal interest of the parties involved in the change of land. The land conversion could have an impact over multiple parties especially in case an agricultural land is converted to a commercial land. In West Bengal, the land conversion process is governed by various sections like sections 4A, 4B, 4C and 4D of West Bengal Land Reforms Act, 1955. Fees of conversion of land as per the latest regulations can be directly deposited directly through treasury challan/draft/DCR up to a maximum of Rs 500/. Any Raiyat who wants to make any change in the area, character or utilization of the land can directly apply to the collector of the concerned area /district. The prescribed format for the same is available online under application forms. Copy of the map of the said land along with the copy of the adjacent land which might be required by the collector for disposal. An enterprise which wants to make change to the land use, character, area etc. may apply to district land & land reforms officer for above 1acre land or the person needs to contact sub-divisional officer of land & land reforms for a land which is smaller than 1acre and larger than 10 decimal. While for the land smaller than 10 decimal, the person needs to contact Block land & land reforms officer for the permission. The person needs to go for the approval with all the adequate copies of documents required and duly filled application form. In case the application of the conversion of land is rejected, the person can contact take the help of a lawyer and challenge the decision in the court. With the advent of the online portal for land& land reforms, many of these processes have been made simple. West Bengal has an online portal to pursue many of the land related procedures like RoR Request, Mutation application, Plot info request etc. Among all these one of the procedure that can now me done online is Banglarbhumi Land conversion application form. Once the person opens the website, there would be a series of options given at the top menu. For Banglarbhumi Land conversion one needs to click on the top left button which is ‘Online application’. This will open some options that can be performed under this. It also has conversion application given as the second option here. The applicant needs to click on this. After click on the conversion application a form will open which has number of mandatory and optional fields. The applicant needs to fill this application form very carefully with best of the available information. After this the applicant need to upload the relevant supportive documents like mutation certificate, rent receipt. Land map, form 1B, NoC from pollution control board and detailed project report and the Captcha code. After all this the user can submit the application form after reviewing the form once thoroughly. The user will be prompted to pay the relevant fee which can be paid through net banking or using a debit/credit card.